Far Infrared Saunas use a safe portion of light wavelengths that penetrate into the body and stimulate healing. The fir infrared will promote additional collagen production and release toxins from fatty tissues. Benefits include weight loss, pain relief and improved circulation. 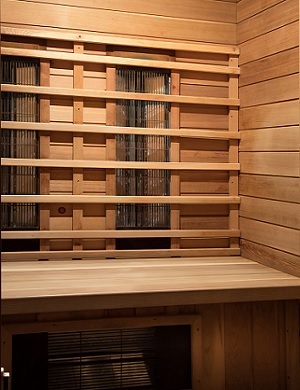 The sauna’s heat penetrates and brings the toxins out and makes the collagen and the cells of the skin more elastic. It also has a positive effect on cellulite as it melts away the fat cells. There are a large number of testimonials and studies supporting these findings. Infrared light therapy will reduce inflammation in the body resulting in improvement in many other medical conditions. Carbon is very popular and are usually large black panels with some wood slats across the front to protect the panel. Ceramic are usually vertical tubes with reflector panels. Ceramic heat up faster and are much hotter. Care must be taken around ceramic heaters as skin can be instantly burned if contact is made directly with the heating element. Each has its own beneficial characteristics. Our top rated brand, Jacuzzi Clearlight, uses a proprietary unique blending of ceramic woven into the carbon fibers of its panels. The panels are warm, safe and effective. More information is provided on the Clearlight page as well as on more details on each type on other brand review pages. Some brands add near infrared light bulbs or near and mid panels to provide full spectrum light therapy. 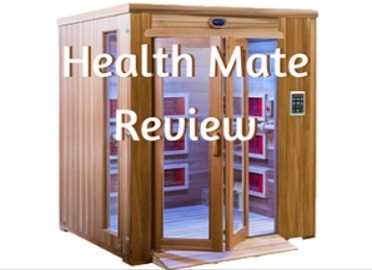 All brands including low EMF infrared saunas are on our main best far infrared sauna reviews page. 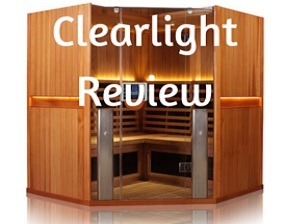 Jacuzzi Clearlight Saunas Started 22 years ago by a Chiropractor. Innovative top rated. Used in top Clinics in the world. Heavenly Heat Saunas Purest of any brand. Made in the USA. 50% of sales are from doctor referred patients. 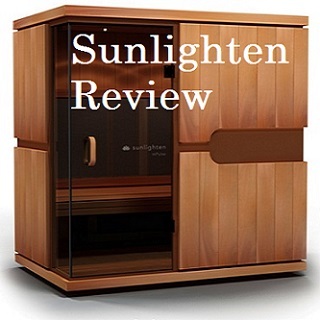 Sunlighten Saunas 15 year history. A top selling brand. Innovative. Vital Health Saunas Efficient cabin designs. Great alternative to cheaper, low quality brands. Health Mate Saunas 30 year history, although slow to change and uses small improvements on old technology rather than innovation. icomfort infrared saunas A cheap, recreational-use only brand. Saunacore High quality, over priced brand with interesting design features. Heavenly Heat is a vastly superior alternative. How Hot do Infrared Saunas Get? How long do you have to sit in a sauna to detox? Does Sauna Benefit Weight Loss? Do infrared saunas burn calories? Do Infrared saunas use a lot of electricity? Can I Use Sauna While Pregnant? Infrared and Auto Immune Diseases? Then build up to half an hour 3 or 4 times per week. Part of healing is knowing your body. So sitting in the sauna is an opportunity to listen to your body. When your body tells you to get out, simply get out. It will tell you when it has had enough. We know of one holistic dentist for the last 15 years that has been taking a session of an hour every day. He is a raw food advocate and he lives by the ocean. He says this hour per day is the core of his health. But most people do not need more a half an hour session at least 3 times a week. You can use it everyday if you have the time and you will feel immensely better. Dr Clement the leader at Hippocrates uses his every day as well. “Using infrared heat therapy in the evening is best if you find that it relaxes you. Mornings are better if it energizes you. Your body will tell you the best time of day. Reports indicate a regular schedule in frequency and timing of day will almost double the effectiveness. If your practice is a couple times a week and at different times of the day, do not be concerned that you are not benefiting. You will still receive tremendous health benefits from your sauna with this type of use as well. However, it is best to have a regular schedule. “A far infrared sauna can get up to 150 degrees. 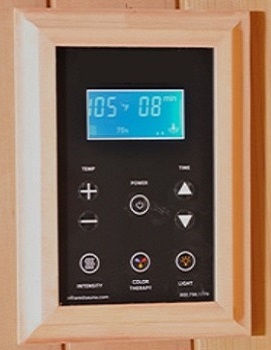 An ideal temperature for an infrared sauna is 110°F to 130°F. The amount of infrared you receive is more important than the temperature. Often, lower temperature produces a better detoxification of toxins. A temperature of 110 is usually reached in 30 minutes or less for a 2 person cabin. A larger unit will require slightly more time and up to 45 minutes to reach 130 degrees. Top rated Heavenly heat brand allows certain heaters to be controlled individually. Full spectrum options can be hotter as the near spectrum is often hot near ir bulbs. “Recent studies have shown that sauna sessions can help detoxify the body of toxins such as heavy metals, lactic acid and environmental contaminants. Toxins are released from subcutaneous fatty tissues when using infrared heat therapy and removed through sweating. Studies have concluded that sweat produced from infrared contains 8x as many toxins as sweat from a steam or traditional sauna. A recent medical study from August, 2018 conducted by doctors at the Mayo Clinic supported the health benefits and improved wellness provided by these light therapy treatments. It has been proven to reduce an alleviate chronic pain, relax of muscle cramps, improve blood circulation, cardiovascular conditions and natural detoxification. “Sweating does remove toxins including heavy metals. Bisphenol A (BPA) is a chemical in plastics and is detected in sweat. However, more toxins are removed through the kidneys and liver. This is why penetrating infrared is superior to steam as it releases toxins from fatty tissues. As the contaminants are unbound from fat cells, they can be removed by more processes than just sweating. It is the resonance frequency of the infrared wavelengths that begins this process. “Studies reveal that 30 minutes at least 3 times per week provide the most healing and detox benefits. However, even 15 minute sessions will provide benefits. Up to an hour is acceptable but is best enjoyed at a lower temperature. 10 minutes is good for a pre-workout muscle warm up. Most people will be safe within these guidelines. However, it is important to allow your body to cool down after a longer session by relaxing for 15 minutes or enjoying a cool shower. The shower is our preferred method and it also washes the skin of contaminants released through sweating. It is important to remember to hydrate well before, during and after your session. Filtered water, electrolyte rich drinks or mineral-rich coconut water are excellent hydration choices. Longer sessions of 45 minutes and more can result in raising core body temperature which induces a temporary condition similar to a fever that can heal. If the is simply warming and relaxing your muscles before or after a workout, then 10 minutes is plenty of time. Note: There is a significant difference between therapeutic healing infrared products and those that are purely recreational. Units that sell for $1500 or less are designed for purely recreation purpose regardless of marketing claims. You will experience little if any therapeutic benefit. This is discussed throughout our website. “You will lose weight over time by using an infrared sauna. As contaminants are unbound and released from fatty tissues via the resonance frequency of infrared, the fat cells themselves can then be eliminated. Fat cells cannot be lost if toxins are bound to them. It is through this mechanism that heat therapy sessions can support weight loss. Sweating alone is not an effective or long term safe method for weight loss. All lost fluids should be replaced through proper hydration. Simple surface sweating especially through use of steam can result in significant electrolyte loss. Always hydrate yourself with coconut water or another healthy electrolyte rich water source. “A 30 minute infrared sauna session will typically burn 400-600 calories, similar to jogging for half an hour. These numbers are for a 150 pound person according to a study published in Journal of American College of Cardiology in 2001. The study was performed by Dr. Masakazu Imamura, MD. This is one way a person will experience real, natural long term weight loss from a heat therapy sessions. The user will experience increased heart rate during use and will receive passive cardiovascular conditioning. This combines with the loss of fat cells after toxins have been unbound and released from the fat cell as described above. The weight loss is not obtained through short term unsafe water loss via sweating. But rather through safe, permanent fat loss and calorie burning. “An average infrared sauna will use approximately 1 KWh of electricity. In the US, that will result in a cost of around 12 cents per hour. Most people will use less than $1 of electricity per week. Two additional practices that will help your body shed the toxins and gain the most benefit are dry brushing and proper hydration. Dry brushing is very effective when done before your heat therapy session. There are a lot of videos and instructions on dry brushing. Basically using a brush specifically intended for this purpose, brush the skin firmly while brushing towards the heart. This has an added benefit of being one of the few things that activates the lymph system. Rebounding is perhaps the best for moving the lymph fluids. Secondly, drink a lot of water before, during and after to re-hydrate. You could also take a good to mineral supplement as you will lose some minerals out of your body along with the toxins. Replace the lost electrolytes with minerals or some good coconut water. We need to discuss when you shouldn’t use infrared heat therapy and some of the concerns that are raised by consumers. One of the biggest questions we get is can I go in the infrared sauna if I have breast implants, joint replacements or platinum in my body. Care should always be taken if the consumer has a heart condition. As the penetrating rays affects soft tissue and especially fat cells, it will normally have no effect on anything that has been put into your body. It will not penetrate any metals and at most it is going to raise the core temperature of your body a couple degrees so it will not melt anything. If you have a heart condition, always consult your primary care physician just to let them know. They may not know much at all about infrared sauna. Explain its low temperature and that unlike a traditional steam sauna, it is comfortable to breathe so there is a lot less stress on your body. Perhaps even send them some of the studies that have been done regarding this therapy and coronary heart disease. “No. If you are pregnant it is strongly recommended to Not use any sauna. The reason is that this will be releasing a lot of toxins from your cells and these would be temporarily available to be absorbed by the growing baby. The time to consider this would be prior to conception. If you are thinking of getting pregnant or wanting to get pregnant that is the time to do a good year of using heat therapy to get as many of the toxins as possible out of your body. When dealing with some rheumatoid diseases like lupus or rheumatic arthritis or similar inflammatory diseases, always proceed with caution. Observe how the body reacts. Many people been helped by infrared but you don’t want to inflame the condition. There are many major conditions that have shown to be improved with the use of this heat therapy. However, always consult your physician if you have concerns. We have studied and researched this therapy for 6 years and experienced many benefits from its use ourselves. We regularly talk with the owners of several companies to stay current on advancements and product offerings. We are confident you will experience improvement in overall wellness from this yourself. The amount of benefit will depend largely on regular use and the quality of the brand you purchase and use. It cannot be overstated that effectiveness varies widely among brands. Treatment involves an increase in core body temperature, not simply warming up the air. Units that have a cost of $1500 will largely be only for recreational use such as warming of muscles prior to exercise. For deep therapeutic benefit and healing, a quality brand that uses effective heaters will be required. Not all high cost brands provide this level of penetrating fir infrared. We have summarized our rating of many well known companies on our best infrared sauna reviews page. As well, each brand is reviewed individually on its own review page which will go into detail on features and how those provide benefit to you. Our hope is that you gain much form our site and that is saves you many hours of researching. When you purchase one of these effective products, it will be like having your own healthy in home spa.